Medicap USB200 Records high-definition video and still images from medical video sources to its internal hard drive, external USB drive, or network drive. It works with ultrasounds, endoscopes, intraoral cameras, surgical microscopes, etc. With the ease of a button or footswitch operator you can archive digital images and videos right on your hard drive or on a secure network. With the Medicap USB200 you can enhance, edit, or email video and/or still images; you can even include them in patient reports. The Medicap USB200 Medical Video Recorder is the medical industry’s most convenient full-featured video recording solution. Your videos and still images are recorded directly to a USB flash drive or optional hard drive. Experience the quality of DVD without the hassles of DVD disks. The Medicap USB200 medical video recorder works with all medical grade cameras. It records high-definition video from your endoscope, arthroscope, surgical camera, or ultrasound device, etc. Flies can be accessed via any computer on your network. This medical video recorder is medical grade and has a fluid resistant front panel. Medicapture built the Medicap USB200 Medical Video Recorder to withstand the rigors of the operating room, and its compact footprint allows it to fit on any cart. Founded in 2002, MediCapture, Inc. is the medical industry’s leading manufacturer and designer of advanced digital video recorders. MediCapture recorders are marketed by the world’s largest endoscope and surgical microscope manufacturers. The company’s market leadership is built on its unique ability to supply doctors and hospitals with friendly, powerful and affordable video recorders that connect to virtually any surgical camera. MediCapture products are medical grade with full certifications for demanding OR environments (ISO 9001:2008, ISO 13485:2003 and ISO 13485:2012). MediCapture offers a global reach through its worldwide offices, including its headquarters in Philadelphia, USA, with subsidiaries in Europe and Taiwan, and sales, marketing and strategic partnerships throughout Europe. 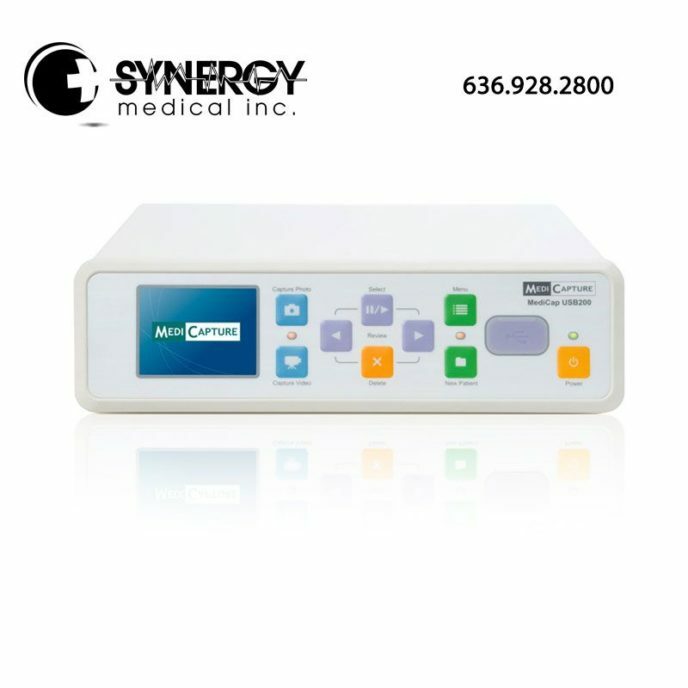 SYNERGY medical, is a certified re-seller of the Medicapture product line. 26 inch NDS Radiance G2 90R0052 Specifications We offer special pricing & volume discounts for Government, GPO, Health System, & Healthcare Facilities. Contact us for details. The Panasonic AG-MDR15 Medical HD Recorder is ideal for surgical image recording of a wide variety of surgical procedures, It is compliant with the Medical Electrical Equipment Standards. The MediCap® MVR Lite 4K is a premium-quality, easy-to-use, 4K Ultra HD medical video recorder that introduces stunning detail and clarity to videos and images not seen before with today’s HD technology. With four times the picture resolution of HD medical video recorders, the MediCap® MVR Lite 4K records greater sense of depth and better color distinctions – providing for a more accurate and superior view of surgical procedure recordings. MediCapture MVR Lite 4K Specifications We offer special pricing & volume discounts for Government, GPO, Health System, & Healthcare Facilities! Contact us for details. Panasonic GP-UH5332 Full HD Specifications We offer special pricing & volume discounts for Government, GPO, Health System, & Healthcare Facilities. Contact us for details.